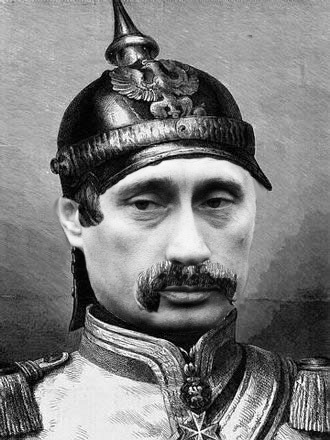 I’ve been accused of being a “Russophile cockroach”, an “amoral Putin lackey”, and overall bad guy. Guilty as charged! Yes, I do like Russia and don’t have much good to say about the Western media’s coverage of it. Yes, I don’t give much of damn for the moralistic posturing that any vapid idiot Kremlinologist can easily excel in. And yes, I do have a positive opinion of Vladimir Putin (as do 75%+ of Russians). Now granted, part of this probably has something to do with the huge amounts of money his FSB minions kindly slip under my door for glorifying their Tsarist godfather on the Internet in my spare time. But this doesn’t necessarily mean that I set my alarm clock to VVP’s speeches, drink prodigal amounts of Putinka for breakfast, and bow before his icon at the Altar of Neo-Stalinism in my basement before logging onto my workstation to fulfill my job description as ein strammer Putin-soldat. In reality, my positive view of Putin is moderate and hedged. Don’t believe my word as “the dishonest, progangadizing (very, very) little maggot” that I really am? Below I present five major shortcomings of the Putin Presidency. 1. Waiting until 2006, or too little too late. Since 2006, Russia embarked on a range of policies designed to check its demographic decline, reduce poverty, and recover its status as a Great Power. The main examples would be the National Priority Projects; a revamped industrial policy; health promotion; pro-natality, AIDS containment and anti-alcohol measures; military modernization; and incubation of hi-tech industries such as nanotechnology. Many of these are already bearing fruit – quite literally on the demographic front, where the total fertility rate rose to 1.56 children per woman by 2009, from 1.1-1.3 before 2006. In conjunction with falling mortality rates, this resulted in Russia experiencing its first year of population growth in 2009 since 1994. But why did Putin take so long to start addressing all these issues? Though there are several possible explanations, I think the most accurate is that at the time Putin was simply too preoccupied with stabilizing the Russian shell of the collapsed Soviet empire. Each functioning state rests on its monopolization of legitimate violence, of tax collection, and of the issuing of money. All three monopolies were under grave threat by the late 1990’s. Homicide rates were sky-high, organized crime infiltrated state structures, and Chechen bandits raided Russia proper. The state was too weak to collect taxes from the oligarchs, producing chronic budget deficits that culminated in the 1998 default. Inflation raged unchecked, most transactions were in dollars or in kind, and many analysts were starting to describe Russia as a failed state. Therefore it cannot be surprising that Putin in his first term devoted most of his attention towards containing and mitigating these mortal threats to the Russian state. The invasion of Chechnya, the political subjugation of the oligarchs, the strengthening of the “power vertical” – all these were intended to restore some modicum of state control over the Russian Federation. Yet as the political struggle went on at the top, the “real Russia” remained largely stagnant. With the inflow of ethnic Russians from the Near Abroad largely exhausted, demographic decline accelerated in the 2000-2005 period. In contrast to the broad-based growth after 2005/2006, in the early Putin years manufacturing remained depressed, while more than a third of economic growth accrued to the recovery in oil extraction. Little new infrastructure was built. The rate of military procurement dropped even below the miserly levels of the Yeltsin era. Thanks to the Putin government’s myopic negligence or administrative inability, Russia’s manifold, deepgrained socio-economic problems only began to be seriously addressed within the past few years. Strike 1 – Contrary to most fans and critics alike, Putin didn’t do too much. He did too little, and too late. Under the first few years of his watch, Russia lost historical time just as it did under Yeltsin. On many socio-economic indicators, the RF in 2010 has only caught up to what the RSFSR achieved back in 1990. 2. Red tape and corruption, or the bureaucracy is expanding to meet the needs of an expanding bureaucracy. Corruption remains “public enemy number one”, according to President Medvedev. This can be confirmed by any number of horrific anecdotes: the absurdly inflated Moscow housing market, bureaucrats owning property worth hundreds of their yearly salaries, entrepreneurs losing their businesses to well-connected thugs. Apart from a few cosmetic house-cleaning campaigns under the Putin President, the state’s efforts to control this scourge have been decidedly lack-luster, and Russia continues to be perceived as one of the most corrupt nations on Earth. [Sources: Transparency International’s “Corruption Perceptions Index”; Transparency International’s “Global Corruption Barometer”, answers to the question, “In the past 12 months, have you or anyone in your household paid a bribe in any form?” (% saying “yes”); World Bank’s “Worldwide Governance Indicators” (Control of Corruption), country percentile]. This corruption is directly related to the arbitrary power of Russia’s bureaucracy, and the labyrinth of regulations that “justify” its existence. Love them or hate them – and yes, most Russians hate them – bureaucrats are indispensable for running a modern state. However, in Russia bureacrats are neither accountable unlike in most developed nations nor held under close scrutiny unlike in the USSR or today’s China. Furthermore, their numbers are well in excess of necessity. In contrast to a few post-Soviet nations like Estonia and Georgia which fired many of their bureaucrats, the Russian bureaucracy grew rapidly under Putin. The extractions of rent-seeking bureaucrats stunt the development of small and medium businesses. Furthermore, corruption indirectly kills people (e.g. grocery pharmaceuticals are expensive and unreliable) and fosters a destructive social mentality in which anything and everything is considered exchangeable for money and the privileged and connected can act with impunity. As the man at the top of the pyramid, Putin was responsible for perpetuating this system during his Presidency. Sensational rumors of foreign villas and multi-billion dollar offshore accounts to the contrary, there is no evidence that Putin is personally corrupt*. However, controlling corruption within one’s circle and further down is extremely hard; no Russian ruler, except the most steely and despotic, has ever managed to rein in his bureaucrats. Now you could go down the neo-Stalinist route, but executing corrupt bureaucrats is now politically incorrect in most places outside China. Perhaps Putin should have simply axed this Gordian knot, like Saakashvili in Georgia**? That might have worked, – no regulation, no bureaucrat, no problem. But something stayed his hand. Maybe he feared chaos, since the bureaucracy is one the forces gluing a nation together. Maybe they were considered necessary to reconsolidate the state and rebuild the power vertical. I don’t know. Maybe Putin shouldn’t have suppressed Russia’s civil society and media outlets if he was serious about checking corruption? But this is a false narrative. It is not the federal government or Putin, but unreformed institutions such as the Ministry of Internal Affairs (MVD), the FSB, the Prosecutor-General, etc, that pose the greatest hazards to Russia’s nascent civil society. It is not VVP who runs around killing and harassing journalists, but the “stationary bandits” in government and/or business taking advantage of Russia’s culture of impunity. The ultimate proof of the pudding is Ukraine – despite its pluralistic politics and journalistic freedoms after the Orange Revolution, corruption there remains at least as bad as in semi-authoritarian Russia***. No matter the personal integrity or ability of Russia’s (or Ukraine’s leaders), the entire post-Soviet state system remains unacceptably opaque and unaccountable. Strike 2 – Putin could have mitigated Russia’s corruption and culture of impunity by: 1) stripping away the reams of red tape that create opportunities for rent-seeking, 2) decimating the ranks of the bloated bureaucracy, traffic police, etc, or 3) increasing the penalties for, or the “costs” of, corruption. In reality, there was some improvement in 1) and 3), and massive backtracking on 2). It is only under Medvedev that government and citizenry are beginning to show signs of taking corruption more seriously. 3. Inequality, or oiligarchs & their little adults. Russians are not Americans. Though most accept the capitalist system, a majority of Russians believe the state has a duty to narrow down inequality between rich and poor and assure everyone a decent standard of living. Opinion polls indicate that around 63% of Russians are essentially “statists”, while only 25% are economic “liberals” and an insignificant 4% are small-government libertarians. Thouh there has been impressive progress on lifting all boats in the past decade – poverty rates were slashed, consumer goods became much more affordable – the Putin regime also presided over an era of slowly rising inequality****. This does not sit well with many Russians, especially the elderly who put great stock in egalitarian values. It is no great exaggeration to say that Russia’s government is by the rich and for the rich. Though perhaps at first necessary as the most reliable way for a broken state to combat tax evasion, the 13% flat tax on incomes now perpetuates inequalities. A much bigger burden falls on productive companies in the form of (highly regressive) social security contributions, which are set to rise from 26% to 34% of the first 400,000 rubles of income this year to help correct the budget deficit. However, Putin had no problems with reducing taxes for oil companies, so that they could either extract and sell off Russia’s oil the faster, or pocket the extra change. Worst of all are the effects on social cohesion. 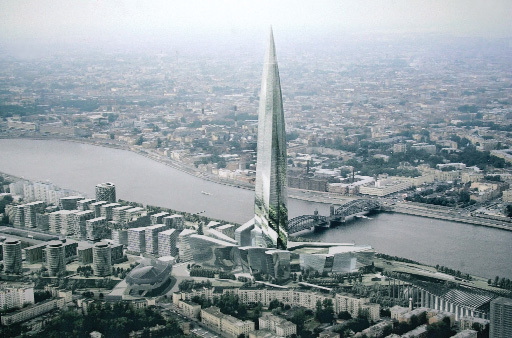 All Russian oligarchs earned their wealth through their connections with the state – there is not a single Sergei Brin or Bill Gates amongst them. The inheritance tax was abolished in 2006, and now more than a hundred Russian children, or “little adults“, are set to acquire billions without earning a single ruble. Sure, these “new Russians” get to experience the shallow thrills of conspicuous consumption, and take power in their sleazy connections with state structures to run over ordinary Russians with impunity (sometimes literally). The price Russia pays for tolerating these historyless elites is a perpetual bankruptcy of social capital, the cooperative spirit that welds a nation together. Amongst other things, this dearth of social capital manifests itself in society’s tolerance for petty corruption. After all, why should a simple traffic policeman, doctor, or other low-paid state worker refrain from taking bribes, when oligarchs make off with billions in cahoots with the state? There has been no effort to check or reverse the growth of inequality under either Putin or Medvedev. Even as the Fair Russia opposition party calls for progressive taxation and a luxury tax, Roman Abramovich is indulging himself to his biggest yacht so far, armed with a missile defense system and laser shield. Strike 3 – Putin presided over an increase in inequality, made all the more unholy by money’s marriage with socio-political privilege. Though neither the trend towards nor the magnitude of inequality is exceptional by global standards, it clashes with Russian popular sentiments and undermines social capital. 4. Economic mismanagement, or stationary bandits who don’t know or care about limits to growth. First, the “Muscovite” rent-granting political economy over which Putin presided is both economically inefficient and socially unjust. Take the Russian oil industry, in which politically subservient oiligarchs are given free rein to manage their own companies. This combines the worst of both private and state ownership. Lacking security over their assets, the oiligarchs are loath to plow too much of their own money into maximizing long-term oil extraction and revenue. Far better to maximize short-term extraction by overexploiting their oil fields, pleasing the Tsar with generous rent payments, and to make off once these fields go into premature decline. In the meantime, astronomical profits are diverted into a few oiligarch hands instead of going to the Russian state. Now granted, Putin’s “purgatory”, run by clans of “stationary bandits”, might be an improvement over Yeltsin’s “hell” of asset-stripping “roving bandits”… but they are all still bandits nonetheless. Yet when all is said and done, it is not entirely clear that Putin could have realistically done better on any of these issues. He inherited the “Muscovite system” from Yeltsin and can be credited with actually making it workable, in the sense that the oligarchs were forced into paying their taxes and Russia’s chronic budget deficits were finally eradicated. Reversing privatization and trying to create a Russian version of Statoil, the efficient state-owned Norwegian energy company, was entirely unrealistic given the institutional rot of the Russian state. The other extreme, a full-scale liberalization of the oil sector, would have probably been counter-productive because of that same weakness of the Russian state. For proof, look no further than how Khodorkovsky used YUKOS’ resource wealth to mount a direct political challenge to the Kremlin… would the Russian people really have been well served if their state had been hijacked by the Menatep bandits? Second, even accounting for its being a cold, landlocked country with a lot of heavy industry, Russia remains very energy inefficient. There are serious uncertainties over its ability to meet future domestic and European gas demand, and its oil production will soon peak and go into decline. However, by world standards, Russia is supremely well-endowed with energy resources. Thus, it makes manifest sense to use the earnings from foreign hydrocarbons sales to aggressively implement energy efficiency measures and build a green energy infrastructure. The World Bank estimates that investing 320bn $ into energy efficiency could save Russian consumers 80bn $ and generate more than 100bn $ in extra export revenues annually. Putin prefers to go the much more expensive route of greatly expanding generating capacity, e.g. by building many nuclear power plants, while less glamorous but cheaper options like insulating housing, upgrading utilities, or reducing natural gas flaring are neglected. So yes, Russia’s policies on energy are short-termist and “cornucopian”, – but the very same could be said for almost any country one cares to name. Only a bare handful of nations, like Sweden or Germany, have made serious commitments to sustainable development (and none acknowledge the concept of Limits to Growth). Third, the main reason Russia experienced such a deep recession during the 2009 global financial crisis was because its banks and corporations had become dependent on infusions of Western credit. Once this system throttled up in late 2008, emerging markets were the first to be cut off. Unfortunately, Russia under Putin’s watch had failed to develop the deep indigenous credit systems that enabled countries like Brazil or China to weather the storm in good shape, and it saw a massive GDP decline of 7.9% in 2009. But it’s not exactly clear how Russia could have prepared better. The main reason Russia’s financial system was starved of capital was because instead of reinvesting the proceeds from hydrocarbon sales into the economy, the government bought up foreign currency reserves in order to prevent an excessive ruble strengthening from short-circuiting the revival of Russia’s manufacturing base. Ironically, by trying to reduce its resource dependency, Russia actually increased its exposure to the Western financial system, whose weaknesses only became obvious with the benefit of hindsight. Nonetheless, despite the severity of the GDP drop in 2009, the Russian economy is now showing signs of mounting a vigorous recovery. Finally, Putin should be given big props for protecting Kudrin – the main architect of Russia’s macroeconomic stability – from the attacks of the spendthrifts and siloviki in his circle. This did nothing to benefit him politically, but as a result Russia today is “one of the world’s most fiscally secure nations”, according to Liam Halligan, chief economist with Prosperity Capital Management. Strike 4 – under Putin, Russia remained economically unproductive, socially unjust, energy inefficient, and acquired a dependence on Western credit. These problems are deep and are unlikely to go away without intelligent intervention by the state. 5. White elephants, or Siberian bridges to nowhere. The global hegemony of the United States rests on the power projection capabilities of its 11 aircraft carrier battle groups. Russia is a regional land power whose strategic interests do not extend far beyond its Near Abroad. Russia’s economic base is seven times smaller than America’s. Even the “structurally militarized” USSR never had much success with aircraft carriers. Russia’s military-industrial complex is now almost an order of magnitude smaller and no longer has access to the big drydocks in Ukraine. Russia can’t even build a decent helicopter carrier, and eventually took the rational decision to order Mistrals from France. The days of the aircraft carrier may well be numbered due to the development of cheap carrier-killing weapons systems. This particular white elephant never was to be. But far too many are real enough, such as the bridge to nowhere near Vladivostok that will connect the Russian mainland to a small island populated by a few thousand residents, projected to cost more than 1bn $ and intended as a showpiece for the 2012 APEC summit. Meanwhile, the roads from the Urals to Vladivostok remain little more than dirt tracks. Now admittedly, white elephants are minor nuisances relative to the first four problems. Their attractions are hardly unique to Russia, and it could even be argued that some, like the Sochi Olympics, are a net positive thanks to their impact on national morale. Nonetheless, I still think improving Russia’s energy efficiency or networking its clunky armed forces is somewhat more important than erecting suspension bridges in Siberia or dreaming about multiple carrier battle groups patrolling the Russian Arctic. Strike 5 – Putin is sometimes too influenced by the traditions of Soviet gigantism to consider humbler, more cost-effective ways of solving problems. But what about that KGB spy’s ruthless suppression of freedom and democracy? False narrative. The majority of Russians approve of Putin and his system – as of 2008, some 75% of Russians felt that they either had “enough” or even “too much” freedom. Today’s Russians feel much happier and freer than in either the late Soviet Union or Yeltsin’s Russia. But hasn’t Putin suppressed the free media and brainwashed Russians into worshipping him? Yet if that were the case, one would presumably expect most Putinistas to be old, sour-mouthed Stalinists, whereas in fact support for Putin (and disillusionment with the West) is highest amongst young, university-educated Muscovite men – the very segment of the Russian population that is most exposed to the West through the Internet and foreign travel! (Of course, to the Western chauvinist, this must mean that the Russian people are ignorant, nationalist sheeple… since nothing can be allowed to challenge their faith, there is little point in talking to them). What about Putin’s hatred of the West? Again, false narrative. Putin the KGB operative is inseparable from the Putin who served under Sobchak, the liberal mayor of St.-Petersburg in the 1990’s, or the Putin who favored the “civiliki” clan (Surkov, Medvedev, “patriotic liberals”) over the FSB-connected “siloviki” in his choice of successor. But why then does Putin antagonize America by maintaining relations with freedom-haters like Ahmadinejad and Chavez? Newsflash! This is Realpolitik, practiced by all sane and sovereign nations. Bending over backwards to advance Washington’s national security interests is not part of Putin’s job description. Not can it reasonably be expected, due to US support for states hostile to Russia (e.g. Georgia) in its Near Abroad. One of Putin’s greatest strengths is that he recognizes the immense harm Russia suffered from single-minded past pursuits of abstract ideals, and rejects mindless idolization of the West as surely as he rejects the old Marxist-Leninist dogmas. He is a national figure of post-ideological reconciliation, a leader who sees no paradox in defending the Soviet Union against politicized attempts to equate it with Nazi Germany while honoring Russians like the dissident Aleksandr Solzhenitsyn or the White general Anton Denikin. Putin’s critics, knowing neither victory nor defeat, are nothing more than the dust at the feet of that great man who continues struggling, striving, and spending himself as Russia’s humble servant. * To the best of my knowledge, all these allegations of Putin’s 40bn $ of personal wealth originate from Stanislav Belkovsky, a professional purveyor of kompromat and creature of Sechin’s silovik clan. ** Georgia’s success at controlling corruption shouldn’t be exaggerated. In recent years, the Saakashvili regime acquired the habit of pressuring independent businesses to provide “voluntary contributions” in return for not bankrupting them under corruption prosecutions. *** Russia’s corruption should be viewed in perspective. Is it a serious problem that reinforces privelege and blights the lives of many people? Certainly. Apocalyptic? Not at all. First, Russia is not excessively corrupt by the standards of most middle-income countries, and there is evidence that “everyday” corruption (as opposed to business corruption) fell under Putin’s watch. See here, here, and here. 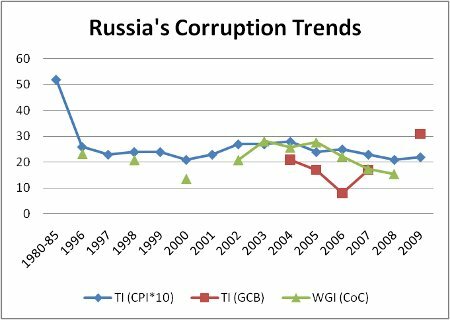 Second, corruption does not seriously affect Russia’s growth potential. Italy was systematically corrupt in the 1970’s-80’s (and still is), as exposed in the short-lived mani pulite investigatations of the early 1990’s. But that did not stop Italy from overtaking Britain’s GDP back in 1987 in the so-called “Il Sorpasso”. Likewise, Russia’s myriad strengths – the strong education system, energy wealth, and macroeconomic stability – means that its systematic corruption is unlikely to constitute an insurmountable barrier against its convergence to Western levels of development. 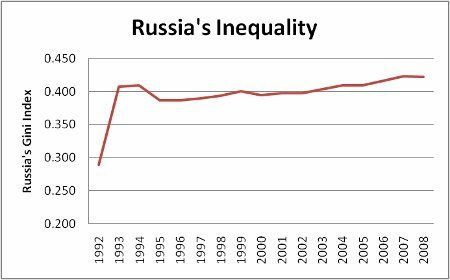 **** Russia’s levels of inequality shouldn’t be exaggerated, however. The Gini index of income inequality has been stable at around 40 since the early 1990’s, and is only high by European standards. (The US and China are at 45, most Latin American countries exceed 50). 22 Comments to "In Which I Criticize Vladimir Putin"
The Pentagon cannot account for 13 trillion (I repeat, 13 TRILLION) dollars but let’s talk about corruption in Russia. Only a completely naive and/or delusional person could take “Russia’s corruption trends” seriously. That's for proving the blogger's dictum that you can never please everyone, no matter what you write. I've never doubted there's more corruption in the US than meets the eye (much of it in fact goes through legal channels). But this post isn't about America. Great piece as usual! I know you’re much more sophisticated than simply believing that everything “under Putin” was “because of Putin.” And yet, your assertion that Putin could (if he wanted to) reverse all negative treands you refer to surprises me. His job was to stabilize (save) the state, not to modernize it. For the latter job, he’s chosen another guy. But I have a different, almost philosophical, question for you. Why 1,000,000 bureaucrats in 1994 is supposedly OK, but 1,600,000 of them in 2008 is supposedly too many? How many is enough and how many is “too many”? I’d argue that (constantly) growing bureaucracy reflects two trends: 1. aging of the population, when decreasing number of working people must support increasing numbers of retirees, and 2. changing nature of threats/challenges to the state (terrorism, climate change, etc.) that become more subtle and thus more difficult to deal with. Both are “natural” trends reflecting changing realities. 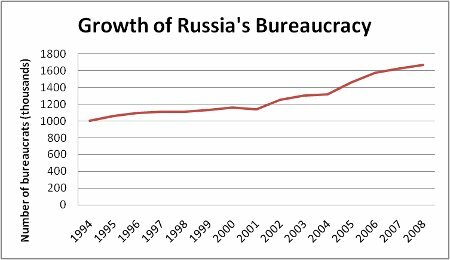 What your “optimal” number of state bureaucrats in Russia would be? Eugene, I must seriously dispute your assertion that Putin's job was "to stabilize (save) the state, not to modernize it". One would hope that a President would try his best to do both. Now I acknowledge that Putin's concentration on stabilization was justifiable in the early 2000's, because the situation was indeed very bad, but I do not believe it was sufficiently critical to warrant almost total neglect of the social sphere. For instance, as Sergey noted in the UT thread, Putin did not take on the tobacco and alcohol lobbies, even through it would have been cheap and unlikely to result in any loss of political capital, and as a result middle-aged male mortality remained at a high plateau from 2000-2005. I don't claim necessarily Putin could have reversed all negative trends if he wanted to... but he didn't even try then. That's the flip side of being a leader - while you're praised for your successes (consolidating the state), you are also held responsible for perceived failures. Re-bureaucrats. The Russian population of working age continued expanding until 2007/2008, so aging during this period was moderate and mostly driven by the dropping share of children in the population. Second, the Russian government is hardly concerned about climate change, and the threat of terrorism has decreased since the early 2000's. So I don't see how any of these factors could have been behind the rise in bureaucrats. The only plausible and justified explanation would be if the bureaucracy had been expanded to implement the new post-2006 social/health/industrial policies, but as you can see from the graph most of the numerical increase actually occurred in 2001-2006. What exactly was the purpose of these 500,000 new bureaucrats? Now I don't claim to know what the optimal number of Russian bureaucrats is, but that too is a valid question. Generally speaking, I think much of the “Putin: Good or Bad?” debate comes down to one of what are the acceptable degrees of corruption, bureaucracy and inequality and, to the extent that they are unacceptable, is it intentional, due to negligence/a lack of political will or an indication of the immensity of the task? Anyway, I know you wrote this in an attempt to win LaR’s heart. So good luck with that! Good summary of the "Putin debate". I know the LaR bit is said in jest, but believe it or not, I didn't write anything new in this post. I've just aggregated my most germane criticisms of Putin in one place. Why? Whenever someone brings out the "you're a Putin lackey" fallacy in future debates, I'll just link to this post. The Pentagon cannot account for 13 trillion (I repeat, 13 TRILLION) dollars but let's talk about corruption in Russia. Only a completely naive and/or delusional person could take "Russia's corruption trends" seriously. That’s for proving the blogger’s dictum that you can never please everyone, no matter what you write. I’ve never doubted there’s more corruption in the US than meets the eye (much of it in fact goes through legal channels). But this post isn’t about America. Great piece as usual! I know you're much more sophisticated than simply believing that everything "under Putin" was "because of Putin." And yet, your assertion that Putin could (if he wanted to) reverse all negative treands you refer to surprises me. His job was to stabilize (save) the state, not to modernize it. For the latter job, he's chosen another guy. But I have a different, almost philosophical, question for you. Why 1,000,000 bureaucrats in 1994 is supposedly OK, but 1,600,000 of them in 2008 is supposedly too many? How many is enough and how many is "too many"? I'd argue that (constantly) growing bureaucracy reflects two trends: 1. aging of the population, when decreasing number of working people must support increasing numbers of retirees, and 2. changing nature of threats/challenges to the state (terrorism, climate change, etc.) that become more subtle and thus more difficult to deal with. Both are "natural" trends reflecting changing realities. What your "optimal" number of state bureaucrats in Russia would be? Eugene, I must seriously dispute your assertion that Putin’s job was “to stabilize (save) the state, not to modernize it”. One would hope that a President would try his best to do both. Now I acknowledge that Putin’s concentration on stabilization was justifiable in the early 2000’s, because the situation was indeed very bad, but I do not believe it was sufficiently critical to warrant almost total neglect of the social sphere. For instance, as Sergey noted in the UT thread, Putin did not take on the tobacco and alcohol lobbies, even through it would have been cheap and unlikely to result in any loss of political capital, and as a result middle-aged male mortality remained at a high plateau from 2000-2005. I don’t claim necessarily Putin could have reversed all negative trends if he wanted to… but he didn’t even try then. That’s the flip side of being a leader – while you’re praised for your successes (consolidating the state), you are also held responsible for perceived failures. Re-bureaucrats. The Russian population of working age continued expanding until 2007/2008, so aging during this period was moderate and mostly driven by the dropping share of children in the population. Second, the Russian government is hardly concerned about climate change, and the threat of terrorism has decreased since the early 2000’s. So I don’t see how any of these factors could have been behind the rise in bureaucrats. The only plausible and justified explanation would be if the bureaucracy had been expanded to implement the new post-2006 social/health/industrial policies, but as you can see from the graph most of the numerical increase actually occurred in 2001-2006. What exactly was the purpose of these 500,000 new bureaucrats? Now I don’t claim to know what the optimal number of Russian bureaucrats is, but that too is a valid question. Generally speaking, I think much of the "Putin: Good or Bad?" debate comes down to one of what are the acceptable degrees of corruption, bureaucracy and inequality and, to the extent that they are unacceptable, is it intentional, due to negligence/a lack of political will or an indication of the immensity of the task? Anyway, I know you wrote this in an attempt to win LaR's heart. So good luck with that! Good summary of the “Putin debate”. I know the LaR bit is said in jest, but believe it or not, I didn’t write anything new in this post. I’ve just aggregated my most germane criticisms of Putin in one place. Why? Whenever someone brings out the “you’re a Putin lackey” fallacy in future debates, I’ll just link to this post. He thinks that aircraft carriers are doomed and that bureaucratic inertia is the only reason why they’re still being used by the US Navy. Yes, I love the War Nerd too. The carrier article is one of his most famous. David Crane has a more technical article called U.S. Aircraft Carriers Vulnerable to Attack? : The Ticking Time Bomb. Personally, I think carrier groups will remain very useful for "gunboat" operations against poor countries. Carrier defenses are not stationary and are being constantly upgraded; in the future, they may well even mount railguns and lasers. So I very much doubt the primitive swarm tactics the War Nerd details will ever put them in much danger. The real threat to carriers that more advanced navies will pose in the next decades are new submarines & advanced torpedoes and cruise missiles, and swarms of drones. Could we please expand on this discussion of the “optimal number of bureaucrats needed to run Russia”? There are some terrific opportunities for humor and reflections on personal experiences there. I would say ‘less is more’ in this case. One distinction of Putin that I wish more people would understand: he is Russia’s Number One Anti-Communist. From denouncing the purges at the Butovo memorial, to giving Solzhenitsyn a medal, to commemorating the Katyn massacre, to marginalizing Russia’s currently existing Communist Party, to expressing his contempt for the communist system on more than one occasion…this seems to me one of his most significant characteristics, and it is largely ignored outside Russia, or worse, turned upside down. By the way, have you read the interview collection with him, “First Person”? All Putin watchers should read it. "First Person" is an excellent book. It was the first book I read after I arrived at my university (I would have read it before but I had been unable to find a copy). Is that the one where he's being interviewed about unfair treatment of some supposed Chechen terrorist (I don't remember precisely the accusations) and his response to the concerns of the journalist is, "You have a warm heart." I mean, everything you could love or hate about he man is summed up in those 4 or 5 words. Right up there with the Kursk comment, imo. One distinction of Putin that I wish more people would understand: he is Russia's Number One Anti-Communist. From denouncing the purges at the Butovo memorial, to giving Solzhenitsyn a medal, to commemorating the Katyn massacre, to marginalizing Russia's currently existing Communist Party, to expressing his contempt for the communist system on more than one occasion...this seems to me one of his most significant characteristics, and it is largely ignored outside Russia, or worse, turned upside down. By the way, have you read the interview collection with him, "First Person"? All Putin watchers should read it. “First Person” is an excellent book. It was the first book I read after I arrived at my university (I would have read it before but I had been unable to find a copy). Is that the one where he’s being interviewed about unfair treatment of some supposed Chechen terrorist (I don’t remember precisely the accusations) and his response to the concerns of the journalist is, “You have a warm heart.” I mean, everything you could love or hate about he man is summed up in those 4 or 5 words. Right up there with the Kursk comment, imo. Poemless, "First Person" is a collection of interviews that Russian journalists conducted with Putin shortly after he came to power. The book focuses mostly on his life. Is the Kursk comment you refer to the time when he was asked what had happened to the Kursk and he said, "It sank"? Poemless, “First Person” is a collection of interviews that Russian journalists conducted with Putin shortly after he came to power. The book focuses mostly on his life. Is the Kursk comment you refer to the time when he was asked what had happened to the Kursk and he said, “It sank”? Thanks - I know very well what First Person is. I was just trying to remember if it was whare I read the "warm heart comment." FSB and Prokuratura aren’t federal institutions?! Wow! OK, good point and my bad. Make that the Russian White House. progressive taxation: Gref and Kudrin stated many times that the flat tax is only temporary and in the future progressive taxation would be instituted. In General if one evaluates Russia circa 1998 and Russia today the change in position/prospects is nothing short of Amazing. Putin as the greatest leader of modern times? Putin has a comprehensive plan to modernize the Russian state by 2020. Well, on the energy efficiency front, there's been talk but very little implementation. The 1996 law had no teeth. ... but no enforcement. And the language was fuzzy (i.e. the government CAN phase out incandescents on the schedule in the legislation, doesn't mean it WILL...etc). Moreover, none of the provisions even touched the fact that the district combined heat and power (CHP) system that supplies most of Russia is totally, utterly broken and dilapidated. Losses of 20-70% before even reaching the consumer are standard (figure from Igor Bashmakov at ЦЭНЭФ). Moscow's weeks of cold showers in the summer are actually about as good as it gets (they get the most tax revenue to work with for upgrades and repairs). The regions are going to get plenty more disastrous pipe failures in wintertime, so this system's failings exert an immediate human toll as well. I haven't heard anything about fixing the CHP system, so I'm pretty pessimistic about the prospects for improving efficiency in the near-to-medium term. Best summary of Putin: HAWT! But hormones aside, I find it interesting that folks like SWP and LR never seem to want to point-by-point respond (in your comments at least) to any of your comprehensive Russia posts. "The days of the aircraft carrier may well be numbered due to the development of cheap carrier-killing weapons systems." He thinks that aircraft carriers are doomed and that bureaucratic inertia is the only reason why they're still being used by the US Navy. Personally, I think carrier groups will remain very useful for “gunboat” operations against poor countries. Carrier defenses are not stationary and are being constantly upgraded; in the future, they may well even mount railguns and lasers. So I very much doubt the primitive swarm tactics the War Nerd details will ever put them in much danger. The real threat to carriers that more advanced navies will pose in the next decades are new submarines & advanced torpedoes and cruise missiles, and swarms of drones. FSB and Prokuratura aren't federal institutions?! Wow! Well, on the energy efficiency front, there’s been talk but very little implementation. The 1996 law had no teeth. The law signed in Nov 2009 on energy saving had from my reading at least a few interesting provisions (the requirement that all homes and apartments have meters installed by January 2012; energy efficiency requirements in the contruction of new buildings; a mandate on state organizations to reduce energy consumption by 3% per year over five years; gradual phase-out of incandescent bulbs on the market)…. … but no enforcement. And the language was fuzzy (i.e. the government CAN phase out incandescents on the schedule in the legislation, doesn’t mean it WILL…etc). Moreover, none of the provisions even touched the fact that the district combined heat and power (CHP) system that supplies most of Russia is totally, utterly broken and dilapidated. Losses of 20-70% before even reaching the consumer are standard (figure from Igor Bashmakov at ЦЭНЭФ). Moscow’s weeks of cold showers in the summer are actually about as good as it gets (they get the most tax revenue to work with for upgrades and repairs). The regions are going to get plenty more disastrous pipe failures in wintertime, so this system’s failings exert an immediate human toll as well. I haven’t heard anything about fixing the CHP system, so I’m pretty pessimistic about the prospects for improving efficiency in the near-to-medium term. Hell AK I’m old enough to remember the Sovs knocking off the Nimitz carrier battle group in Red Storm Rising, and that scenario was written 30 years ago before 250 mph torpedos when subs were a lot noisier than now and the Backfires/Bears had huge radar cross sections and probably a lot less survivability than Clancy gave them credit for. But if anyone goes after a carrier it probably won’t be Russia or China but another country. That was a good book. Of course, as it turns out, the US didn't really have those stealth fighter-bombers that stunted the initial Warsaw Pact offensive. He also probably underestimated the reluctance of the Soviets to use the tactical nukes. To be fair, carrier defenses have improved since a generation ago, though carrier-killers have improved faster, which is what really matters. Hell AK I'm old enough to remember the Sovs knocking off the Nimitz carrier battle group in Red Storm Rising, and that scenario was written 30 years ago before 250 mph torpedos when subs were a lot noisier than now and the Backfires/Bears had huge radar cross sections and probably a lot less survivability than Clancy gave them credit for. But if anyone goes after a carrier it probably won't be Russia or China but another country. Of course, as it turns out, the US didn’t really have those stealth fighter-bombers that stunted the initial Warsaw Pact offensive. He also probably underestimated the reluctance of the Soviets to use the tactical nukes.